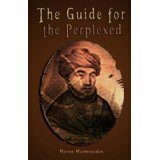 Readers of Gil Yehuda’s review of my book Maimonides: Reason Above All will understand why I like it better than all the other reviews about my writings. 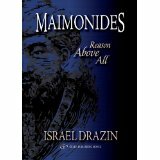 I enjoying Dr. Israel Drazin’s book, Maimonides: Reason Above All, and I wanted to share this review. First I’ll summarize the structure and content of the book. Then I’ll suggest why I think it is an important book. Finally I’ll comment on the challenges this book poses to the reader. This is the third in a series Drazin authored about Maimonides; it’s the fourth if you include his book “A Rational Approach to Torah” which is topically related. The book is stylistically similar to Drazin’s other books, but its contents are unique. It references his other books – so readers might consider getting them too. In this book Drazin addresses additional context that helps us explore Maimonides’ innovative contributions by contrasting and extending it. The book contains four sections, each with many short chapters and a few tangential excursions into related topics. The first section discusses Maimonides in context of his family. It includes a chapter about his father Maimon and a few about his son Abraham. Other chapters describe his family life, wives, bother David, grandchildren, and the general society. This section also contains a chapter on Aristotle – who was an influential ancestor to Maimonides’ thinking. The second section highlights some of Maimonides’ writings. Included are nearly 20 chapters on topics related to law, medicine, intellectualism, and Maimonides’ unique interpretation of many biblical ideas. Drazin hardly shies away from the difficult questions. In fact, each chapter challenges conventional thought and provides insight into a rationalistic approach to religion. It becomes quite clear why Maimonides is both celebrated by many, and was also victim to many attempts to ban his books (and in one famous case in France sometime around 1235 even has his books burned by church officials upon the advice of some rabbis). In the third section, Drazin proposes his own thoughts that are logically extensions of Maimonides’ rationalistic approach. It’s a bit of a head-game here, and I’d caution the reader that it makes little sense to read this section without first reading the first two sections (or Drazin’s other books on Rationalism). The fourth section covers some important Jewish and non-Jewish philosophers who disagree with Maimonides. You’ll note that the book has a cyclical feel to it, as you will find that the two main characters in the first section – Maimonides’ father and son are two great philosophers who are also in the category of people who disagree with Maimonides’ philosophy. A nice feature of the book’s arrangement is that you can read it in parts, and you can pick it up in the middle. Drazin’s style is accessible. Each chapter introduces a topic, lists provocative questions, provides fascinating discussions that address the questions, and concludes with a summary. Drazin expects the reader to have some background in Judaism, but he translates and explains all Judaic terms so that this book reaches a wide audience. Footnotes are provided, but not as many as you’d find if this was targeted to academics. There is an extensive section listing additional readings, but no index. Maimonides struggled with two groups of people. The first wanted to follow the religious teachings they grew up with, to be good people, and earn a first-class seat in heaven. But they entertained mystical and in many cases, non-Jewish ideas about demons and angels; they were fascinated with magic, loved miraculous stories, and harbored fatalistic ideas about God’s predetermined plans for each blade of grass. Maimonides did not see the world as these people did. He was an intellectual, highly educated, and well versed in the philosophy of the ancients (the Greek masters) and his contemporaries (the great Muslim thinkers of his age). But Maimonides struggled with the philosophers too. He felt many had lost sight of religious values by using their philosophical arguments and scientific facts to reject the deep wisdom of religion. And he also rejected the pseudo-philosophers who using the fancy dressings of philosophy to dishonestly clothe primitive and popular mystical ideas. Maimonides followed a third way – and argued that this path is actually the original intent of the Rabbis – and of God. His way holds steadfast to the notion that religion is relevant and important, but rejects (or at least carefully avoids) the irrationality associated with religion. Maimonides was well aware that rabbinic literature is full of mystical and magical stories, but he asserted that these are deliberately crafted to contain deep meaning to the intellectual while being palatable to the non-intellectual masses. The “noble lie” hides truth in a package that common folk will accept, and the true scholar will understand. The two classes of people Maimonides encountered are alive and well today. The first category contains religious adherents – most prevalent with those who find religion later in life. They are taught to believe many illogical and anti-scientific ideas. Moreover, many are programmed to believe that their very identity as a religious person is connected to their ability to reject logic. And thus logical conversation with them is futile. The problem with these adherents is twofold: First. Many adhere to religious notions that are not actually Jewish while rejecting notions that are. And this erodes the religion by blurring its message. However these adherents are usually unwilling to divorce themselves from their worship of foreign ideas – since they reject any logical exploration of beliefs. They only believe what their rabbi tells them – and their rabbi may not be educated enough to even know when he is misguiding his flock. The second problem arises when a life event triggers this religious adherent to reconsider. He then realizes that his religious beliefs are illogical, and then joins the ranks of the secular intellectuals who already rejected religion as being illogical and therefore wrong. Maimonides challenged both approaches by developing a thoroughly religious experience that was also logical, rational, and pro-science. This approach implies two expected results. One is that Maimonides would carve a place for only a very small group of people who thought like he did. The Rabbis would excommunicate him for challenging their teachings. And his peer intellectuals would not understand why such a smart guy like Maimonides still holds on to the primitive rituals that are oh, so, outdated. The other outcome is that Maimonides’ message would be so subtle and beautiful that most people would simply not understand it anyway. It is the great tragedy when brilliant people share their ideas with the foolish world. In the case of Maimonides, both happened. During his life and many years afterwards, Maimonides was the subject of heated debate. Over time, the debate eroded into near-universal appreciation. In irony, most branches of Judaism, even those he might distance himself from, lay claim to being the spiritual heirs of his philosophy. The highly mystical Sephardim are quick to remind us that Maimonides was Sephardic. The Kabalistic and their Chassidic decedents freely quote him in their literature. The yeshivish world, and in particular those who follow the Brisker methodology could not go a day without casting Maimonides as “one of them”. So will the real Maimonides please stand up! Drazin continues his attempt to shine a clear light on the real Maimonides. And this is important. Not only for the honesty of this approach, but because his message of creating a rational path in religion is incredibly relevant to the polarized and blurred Judaism of today. I fully expect that some people will find this book shocking and provocative – it is so intended. They will not be equipped to handle the challenge to the very ideas that they believe their religion rests upon. But those who have confidence in their convictions and faith in their faith will be amazed that they don’t have to suppress their beliefs in order to find religion. And they will be inspired to learn new insight in to the very religious notions they always held true. When reading a book about a remarkable person, one should take note of the author and wonder what it is about the subject that connects the two. Maimonides was clearly an exceptional and remarkable man. He represents a philosophical viewpoint that has shaped Judaism’s development considerably. He is widely recognized for his landmark work to singlehandedly document, categorize, and clarify the entire gamut of Jewish Law. He is also celebrated as the greatest Jewish philosopher. His writings are required study for anyone interested in Judaism, and his works are the basis of deeper study by most elements of Torah scholarship. And yet, his persona does not fit the standard mold of the typical medieval rabbi/scholar. He was a physician by profession. This was due to his strong belief that one must study the natural sciences, maintain a healthy personal lifestyle, and earn a secular living so that one is neither a burden to society, nor profits from teaching Torah. Not typical at all. Rabbi Dr. Israel Drazin does not enjoy the fame and celebrity of Maimonides. But he is also a remarkable person. In addition to being an ordained Rabbi, and an acclaimed scholar in many areas of Jewish studies (most notably an expert in the largely ignored but highly important Onkelus translations of the Torah), he is also highly secularly educated (JD and PhD) and was one of the highest ranking Jews in the US army – a Brigadier General. He too does not fit the mold of the typical Rabbinic scholar. And like the subject of his book, he too boldly challenges conventional mythology in order to find religious truth. What this means: if you are a fan of Drazin’s works, then get this book – you’ll love it. If you appreciate this book, you’ll want to get his others too. If you think the book is anti-religious and attacks the notions you believe in, that’s OK too. Judaism is capable of including Maimonides’ voice despite the fierce opposition to his ideas. Maimonides survived it, and I suspect Drazin will survive his critics too. Personally I find Drazins’ book to be a great Bar or Bat Mitzvah present. Kids should read it as they form their religious identity, Adults even more so.